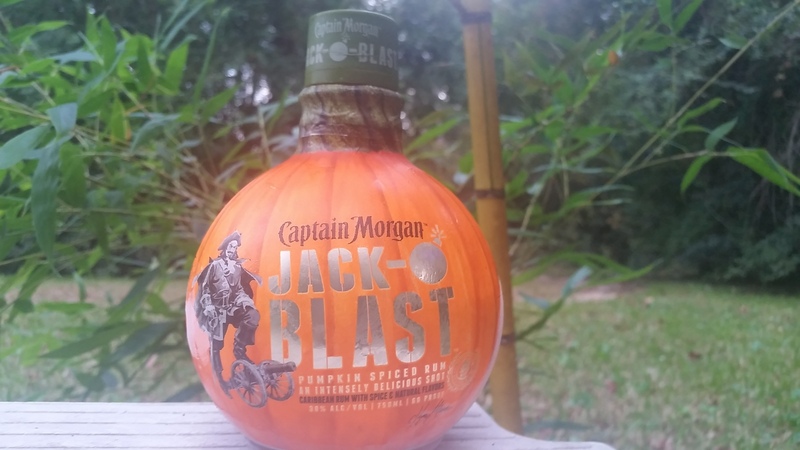 Have you found an online vendor selling Captain Morgan Jack O Blast Spiced? this one is suprisingly very tasty on its own. easy to drink. pours like a golden rum. tastes like pumpkin smells like halloween. but is coyingly sweet. its like pumpkin syrup. if i need something in a cocktail that calls for fireball but I want to add pumpkin spice instead of cinnamon.. I reach for the jack-o-blast. This rum is very spiced. It is full of the fall spiced hence the pumpkin label. Although the product is marketing driven, the taste is true to the label. The rum is not harsh and good for a shooter. It has nothing to do with the Canon Blast that is only good as a pipe cleaner. Sugar: estimated at 48 GPL. Another novelty rum and bottle from the Captain. Unlike the Cannon Blast you can actually drink this one! It's true to it's label. Pumpkin flavoured rum. It's similar to Captain Morgan Private Stock but with pumpkin pie spices. It's very sweet but overall it's not bad in limited applications. There is a strong flavor of Nutmeg, Cinnamon, and spices mixed in with 60 proof rum. We sampled it for fun and thought not bad and put it on apple pie and then proceeded to sip it. It's okay on it's own but just one serving would be enough. Had a rum tasting on a sunny Saturday afternoon, because why not. 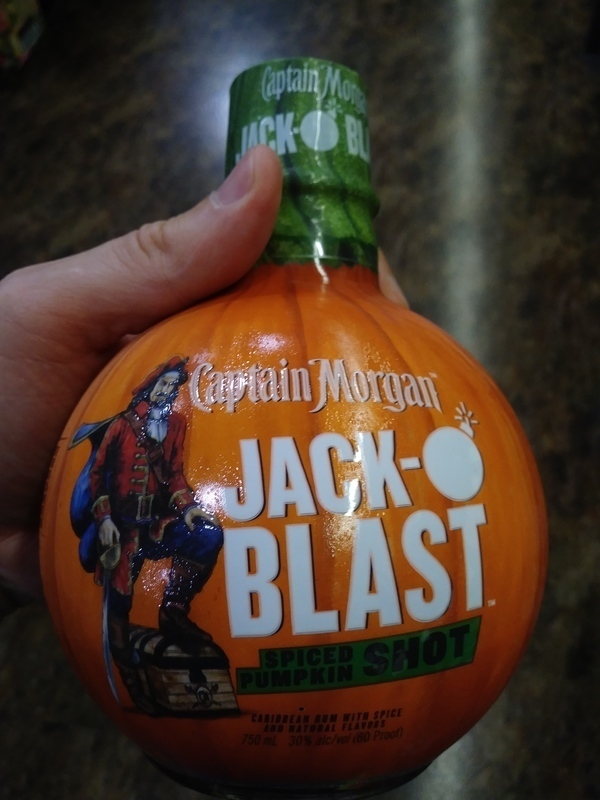 Captain Morgan Jack O Blast Spiced Rum bottle looks very fresh and unique trying to mimic a little cannonball. Light golden color. Awful artificial pumpkin is the immediate flavor bursting out, but also pure alcohol to the nose and palate. Very strong burn at the end. Better skip this one for your own sanity. I am a huge fan of anything pumpkin flavored. I was glad to see that captain brought this back this year. I bought 6 bottles last year and was running low. Over ice this makes a great seasonal get together drink. Hope it continues next year. This rum is perfect in a pumpkin spice latte or a chai tea. It’s not bad straight but is quite sweet! I give it a 7 not based against other rums but on what I like to enjoy this rum with and for. Mixed with apple cider and ginger ale for a fun seasonal cocktail. What can you say about a gimmick. Like always when the captain comes up with these gimmicks it fits just right. I own each of the 3 captains ball bottle rums and just just like the other two this one falls right where I thought it was going too. I find this a fun drink to share with friends. However, it would not be a quick restock or go to drinking rum for me. That is truely the reason for the rating. Tastes great in cola by a fire on a cool fall evening. What's to say about this. If you are looking for a rum based, ready made shot, and like pumpkin, this is for you. It's a novelty and a gimmick, but it works. Needs to chilled. Very smooth and drinkable, but very sweet. This was great as a pumpkin drink for the fall. Not as sugary as some vodkas or the creams. Great by itself as a shot or I liked it with ice. Little bite lots of spice and good amount of pumpkin. I also tried it in a pumpkin beer and Sam Adams Octoberfest. It was amazing. Definitely need for fall nights when you got white girls around or if your alone and wannakick your beer up a notch. Grab a bottle and try it you won't be disappointed. This is a decent pumpkin rum. While the Cannon blast is lime rum with a kick of jalapeno, the Jack O Blast is a sweet pumpkin pie rum with a kick of Red Hots candy. It's actually not bad at all, but it's not a real rum, and there are a lot of better rums out there.